Fresh apple pie is a cornerstone of the fall season. However, not all of us have the luxury of having the day to prepare homemade pie crust and visit the apple orchard to pick the season's best. These hand held five spice apple pies are a great alternative to traditional apple pie. 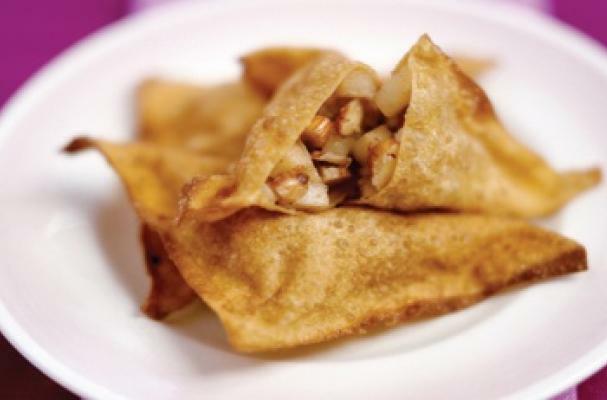 Instead of pie crust, spiced buttery apple are filled into wonton wrappers and fried. I like to dust them in cinnamon sugar or drizzle some salted caramel sauce just before serving. You can even tuck them in a bowl of vanilla ice cream with the pies on the side. Step 1: Squeeze lemon juice into a large bowl. Peel, core, and dice apples into small chunks, placing them in lemon juice so they will not brown. Drain and discard lemon juice. Step 2: Melt butter in skillet. Add almonds and apples and sauté for 4 minutes, until apples begin to brown. Add liquid and continue cooking until it’s gone. Remove pan from heat, let cool slightly, and stir in five-spice powder and vanilla extract. Step 3: Fill a small dish with water. Place a won ton wrapper on a plate or clean counter, and spoon about 1 teaspoon apple-almond filling in the center. Dip a finger in water and moisten the corners of wrapper. Fold in half, pinching and sealing tightly. Place under a damp paper towel to keep from drying out and cracking, and repeat with remaining won ton wrappers and filling. Step 4: Fill a high-sided pot with 1 inch of canola oil. Turn to medium heat and bring to 350°F. Fry won tons in batches for about 15 seconds each side, or until golden brown. If the oil begins to smoke, reduce heat. Drain on paper towels. Step 5: Serve immediately, or store for up to a day refrigerated and reheat in a 350°F oven for 15 to 25 minutes.